In August, UFC heavyweight Stefan Struve (pictured) revealed a leaking aortic valve and an enlarged heart had put his fighting career in jeopardy. Despite the bleak prognosis, the 25-year-old remained hellbent on returning to the Octagon. 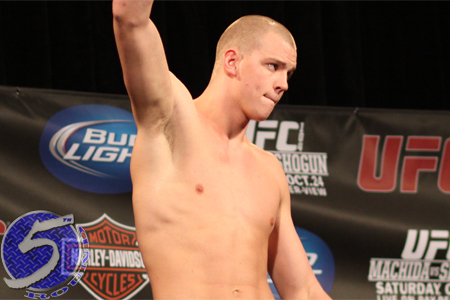 Early Wednesday morning, Struve said his condition has gotten better and he’s been authorized to resume training on a monitored basis. “So the news is that my heart has decreased in size and because of that the aortic valve leakage has gone from medium severe to minimal!” Struve tweeted. “Training with medication and monitoring that,” Struve said of what his next step was. While Sturve finally received a positive update regarding his heart condition, he still faces a long road filled with a battery of tests before doctors will clear him to push his body the way he needs to in order to fight again. Regardless, any good news is great news for Struve at this point. Struve owns a 25-6 professional MMA record. “Skyscraper” has fought 13 times for the UFC since joining the promotion in early 2009, winning nine of his scraps inside the Octagon.